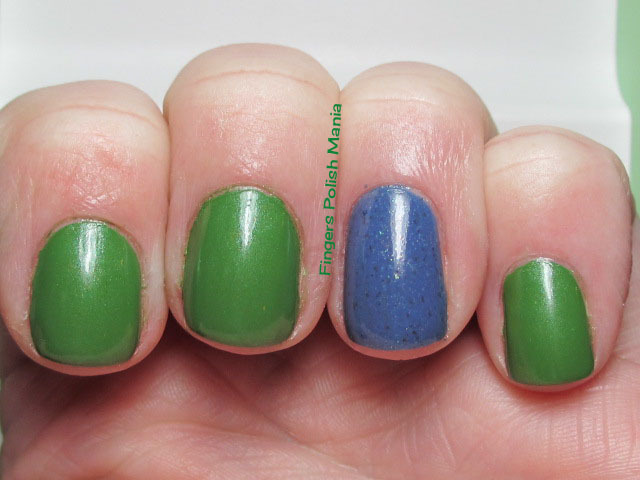 fingers polish mania: I'm free! Today is the first day of my Christmas vacation. I am so happy to not be at work. I really need a break. Tomorrow, I make the nine hour drive up to my parent's house. I just love a good road trip. The latest on my life? I had been talking to this really cute guy for an hour a day for a week. We were getting along and it was nice. We were making plans to meet today in fact when he told me he had gotten a text from his ex girlfriend. Stupid me spent time on the phone helping him figure out what to do about this. Why? Because I'm stupid. She of course wants him back. He told me I had nothing to worry about that she had burned him once and he wasn't going to let that happen again and he'd call me. I'm sure you know what I'm going to say next. Of course he didn't call and went back to her. I have to admit that hurt. Yes it had only been a week yes I hadn't met the guy yet, but I had had hopes based on the talks we had had. I know eventually I'll realize that I'm better off because he's obviously not over her and that wouldn't have made for a good thing for me. The other guy that I've been texting a couple times a day for the past three months and have only seen him twice? I told him that we either needed to step things up or quit. It's not the kind of relationship I want. I told him to think about it over the holiday and we'd talk then. In the meantime, I'm still getting the same old tired pick up lines. When will guys learn? Today I have exciting polish to show you. 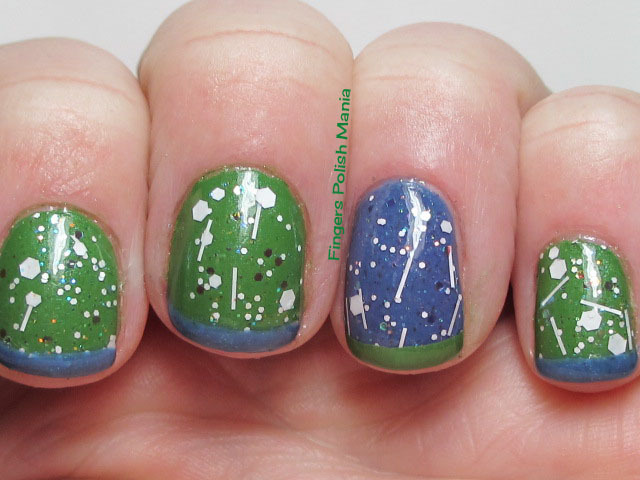 It's my indie fave, Elevation Polish! Her restock is today so be sure and check that out. Of course, I still didn't have the sun for these pics but the beauty is still there. It's an Elevation Polish fest! This is Jungfrau, Froze to Death and Freeway Park. Freeway Park will be for sale today and Jungfrau in January. I started with Freeway and an accent of Jungfrau. I just couldn't decide which one I wanted to try first so I just did both! Here is the first step! Oh how I love kelly green with shimmer! So gorgeous. Jungfrau is no slouch either! Stunning! 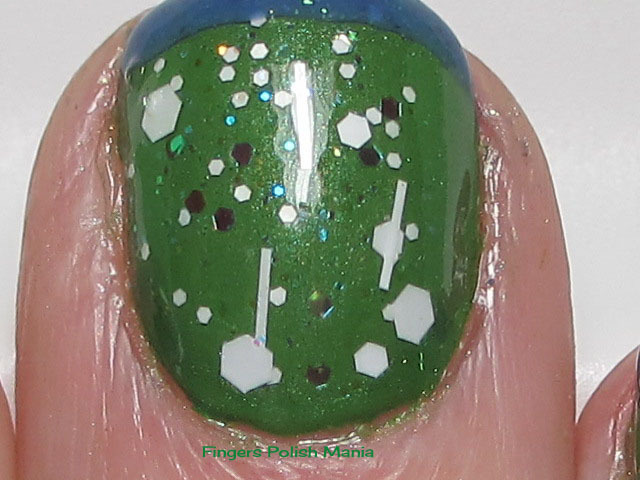 Next I added a layer of Froze to Death which is a glitter fest of white and holo pieces. Here is that step. I wish the sun had come out for this! 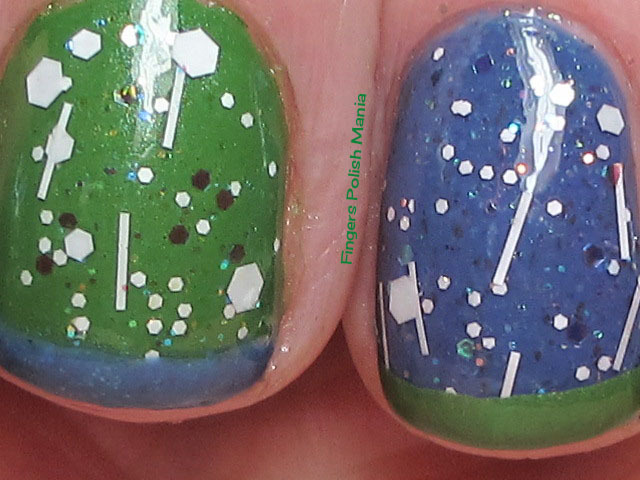 Next I simply did my funky using the opposite color. Here are the results. I think these two colors are amazing! 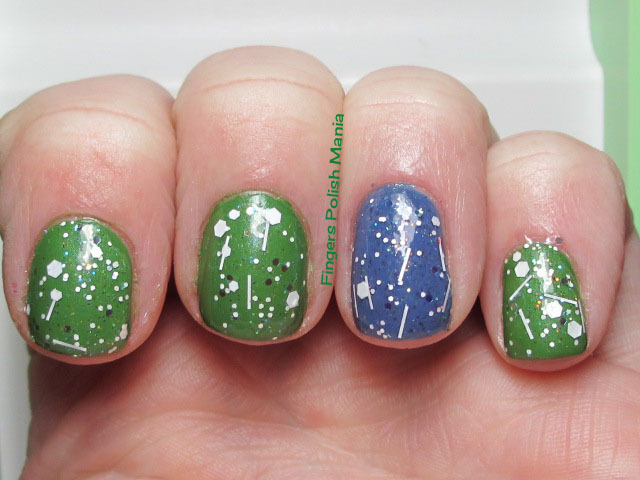 I am continuously amazed at Elevation Polish and her new colors! Just so happy about these! Be sure to check out the sale today! Click here to get there!